Fun fact: I actually have a regular job in a regular office complete with my humble abode of a cubicle. While our work style of dress would best be described as business-casual, I’m fortunate to work in a department that is relatively free-spirited when it comes to self expression in the form of nail colors. I haven’t worn any of the stiletto nails to work because I can’t type with them, but I get compliments all the time and many of my coworkers watch out for the days when I come to work with a new nail design. If you’ve scrolled through my blog, you’ll see that the great majority of my designs are not conservative-workplace-appropriate but I hope you nail divas with constraints can try this look. I painted all but my index fingers with Essie Ballet Slippers, a very pale and sheer cool pink color. 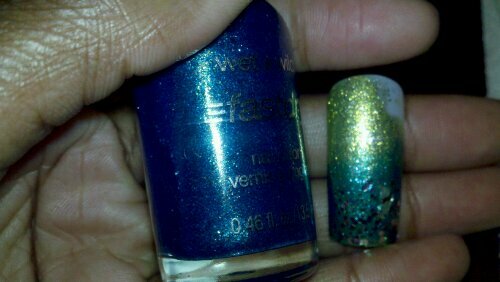 It actually took 4 coats for me to get it this opaque :-|. This required a great deal of dry time between coats to avoid bubbles later. Sorry folks, I’m not a sheer polish fan but I love this color and it’s been sitting in my collection for months waiting to be used for the first time. For my index fingers I used 2 coats of Orly Tiara, my go-to silver microglitter polish, and 2 coats of Sally Hansen Extreme Wear Set the Stage, a clear top-coat based polish with large gold hexagonal glitter pieces and smaller gold microglitter pieces. I topped it all off with CND Super Shiney because I don’t think my nails could’ve taken the thickness of my normal Seche Vite. So what do you think? Do you think you could get away with this bit of pizazz? Maybe on a Friday? P.S. 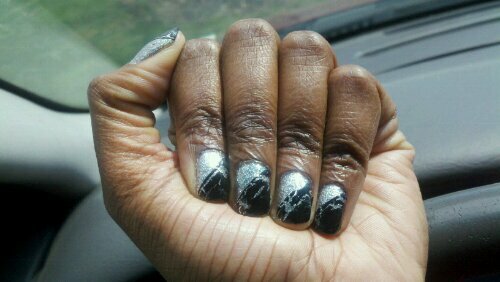 Here’s the manicure I rocked for my high school reunion last weekend. I kept it simple. 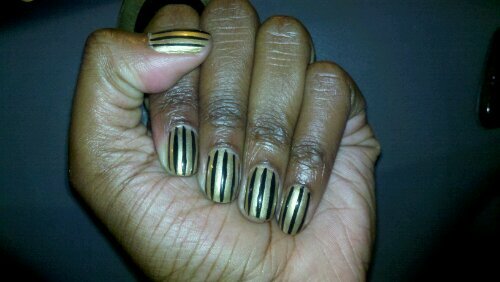 Two coats of Essie Shift Power, a gold polish that is neither creme nor a true shimmer but awesome, and thin stripes with my black Art Deco Nail Art Striper. Thus ends Chapter 1 of my OPI Black Shatter story. I anticipate many more chapters in the future as I come up with more ideas of how to use it. P.S. My fingernails never match my toenails nowadays. They may coordinate but that’s it. I just can’t have 20 nails that are the same color. But with this mani…for a short time…my fingernails and toe nails coordinate. Check out Orly Tiara on my freshly pedicured Foot Snausages below.